LAHORE: (Tuesday, April 11, 2017): Punjab Minister for Higher Education Syed Raza Ali Gilani has inaugurated the office for establishment of Punjab University Medical College at Undergraduate block here on Tuesday. 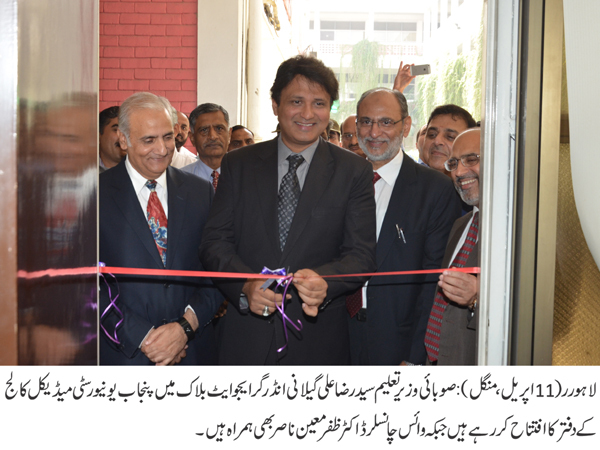 PU Vice Chancellor Prof Dr Zafar Mueen Nasir, Registrar Dr Muhammad Khalid Khan, Dr Muhammad Awais, President Academic Staff Association Javed Sami, Secretary Iftikhar Ahmed Tarar, deans of various faculties, heads of departments and a large number of students were present on the occasion. 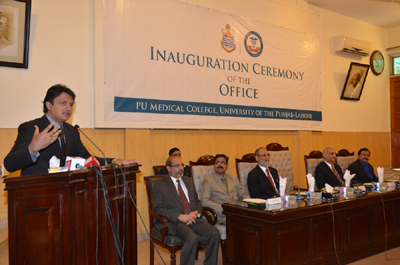 Addressing the ceremony, Mr Raza Ali Gillani said that he had announced to set up PU Medical College and now steps were being taken practically for its establishment. He said that he was paying special attention to improve world ranking of Punjab University and in this regard, the government would utilize maximum resources. However, he said, the dream could not come true unless teachers play their role for raising standard of the university. He said that no goal could be achieved without collective efforts. He said that the government was giving special attention to produce quality students. He said that the government was also establishing faculty development academies to equip teachers with modern teaching skills. He said that there would be no student organizations on campus and students would study there only as they had come for their studies. PU Vice Chancellor Prof Dr Zafar Mueen Nasir said that we would make PU Medical College the best medical college and we wished that sensitive operations like heart and liver transplant could be carried out there in future. Giving a briefing on the salient features of PU Medical College, Dr Muhammad Awais said that it would be a world class medical college where the best healthcare services and quality education would be provided. 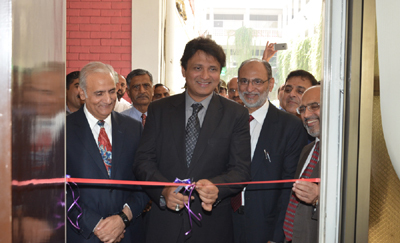 He said that the services that would be provided in the college would be unmatched. 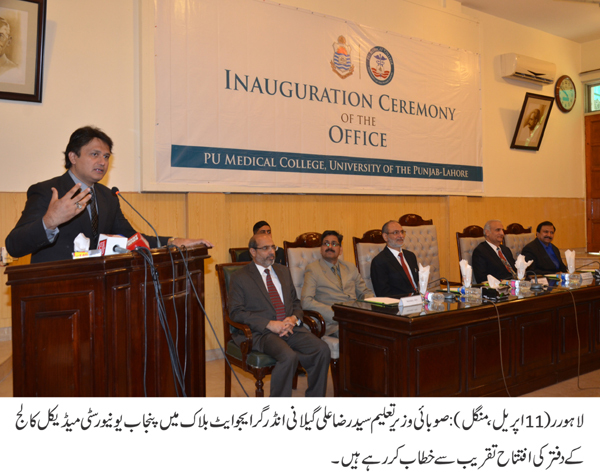 Later, Minister Higher Education Raza Ali Gillani inaugurated PU Medical College office at Undergraduate Block.